Kick off your day with this healthy smoothie. It’s loaded with antioxidants and omega-3 fatty acids. Put everything but the chia seeds and banana in a blender container and soak overnight. 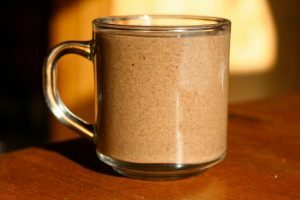 In the morning, grind the chia seeds in a coffee grinder and add to the smoothie with the banana. Add more almond milk if you prefer it more drinkable than spoonable. If not eaten right away, the chia will make it super thick. Be sure to buy chocolate that’s organic, fair trade or sourced from the Americas to avoid supporting child slavery in Africa.